By Kalea Hall | October 8, 2017 at 12:00a.m. Sam Covelli believes Youngstown State University is the heartbeat of the surrounding community. He and his wife, Caryn, of Warren-based Covelli Enterprises, want to keep that heart beating, that momentum going, so in turn the community can thrive. Their recent $1 million donation to beautify YSU athletic facilities is intended to do just that. The donation will be used on the athletics facilities west of Fifth Avenue across from Stambaugh Stadium, particularly Farmers National Bank Field and the YSU softball field. For years, the North Side neighborhood surrounding the facilities was filled with vacant homes and empty lots. After more than a decade of cleaning up the property, in 2013 YSU constructed a soccer and track-and-field complex and a softball field on the site. The fields are now home to the YSU women’s soccer, men’s and women’s track and field and women’s softball teams. Local high-school soccer and track-and-field programs and YSU intramural teams also use the facilities. 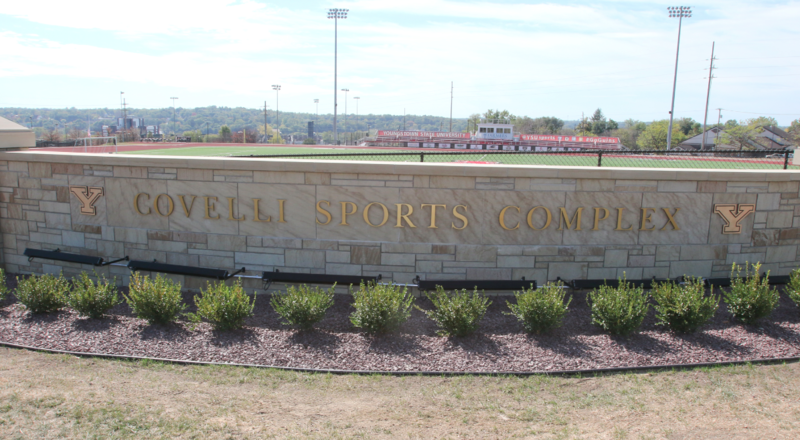 The athletics facilities across from Stambaugh Stadium on the west side of campus are now named the Covelli Sports Complex in recognition of the gift. The Covelli Sports Complex will include the soccer and track-and-field facilities and the softball field, and a proposed new tennis center. Last December, Covelli received an honorary degree from YSU when he gave the commencement address. In 2016, Covelli Enterprises donated more than $28 million to nonprofit organizations. Covelli’s company owns and operates 320 Panera locations in seven states and Canada and employs more than 30,000 people. In addition to the Panera cafes, Covelli also operates five O’Charley’s restaurants and nine Dairy Queen stores. Covelli has hired several YSU graduates and students, so he sees what the institution provides. November 24, 2012 12:01 a.m.
November 22, 2011 12:01 a.m.